The deliberations of the 20th Meeting of the Contracting Parties to the Barcelona Convention (COP20) spanned over four days from 17-20 December 2017 in Tirana, Albania. More than 150 delegates from the 21 Mediterranean countries and the European Union that are parties to the Barcelona Convention discussed and agreed upon several decisions. The main theme of the meeting this year was the implementation of the 2030 agenda for sustainable development with focus on Sustainable Development Goal 14 on pollution and biodiversity. implement effective national monitoring programmes based on the Integrated Monitoring and Assessment Programme of the Mediterranean Sea and Coast. 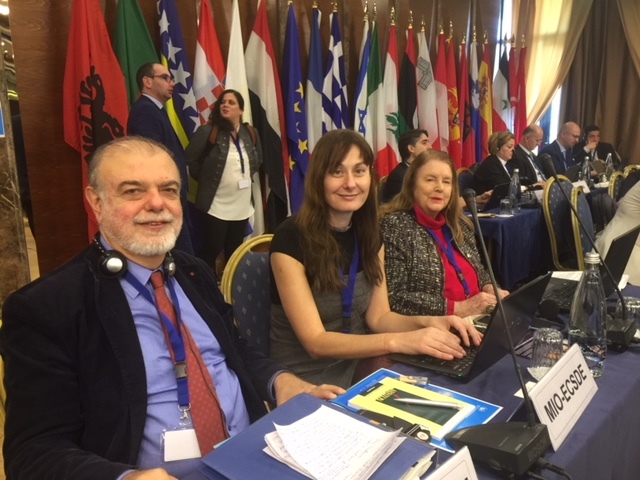 MIO-ECSDE actively participated in COP20 and welcomed a series of decisions relating to the: Implementation and Monitoring of the Mediterranean Strategy for Sustainable Development 2016 – 2025 and of the Regional Action Plan on Sustainable Consumption and Production in the Mediterranean; 2017 Mediterranean Quality Status Report; Updated Action Plan for the Conservation of Marine and Coastal Bird Species; Identification and Conservation of Sites of Particular Ecological Interest in the Mediterranean, including Specially Protected Areas of Mediterranean Importance. In her statement during the ministerial segment of the meeting MIO-ECSDE Programme/Policy Officer, Thomais Vlachogianni said “To achieve the targets of SDG14 within the timeframes set, it is vital to adapt, replicate and scale up existing best practice solutions. The collective Mediterranean experience has a wealth of case studies to showcase (reflected also in the recent 2017 Mediterranean Quality Status Report) on how we can work together in order to address and hopefully reverse the negative trends that affect the Mediterranean. MIO-ECSDE has actively contributed with concrete showcases related to combating marine litter, strengthening biodiversity protection combined also with education for sustainable development in coastal and marine MPAs, facilitating dialogue and consensus building for ICZM and IWRM in transboundary settings; enhancing interactions on the science-policy interface”. Ms. Vlachogianni also stressed that more effective collaboration between civil society and Contracting Parties is critical to implement the 2030 Agenda for Sustainable Development and achieve SDG14 and called for stronger linkages to the NGO and civil society sector, in terms of funding and support, enhanced involvement of NGOs in the decision-making process but also in terms of creating pathways for NGOs to report on the how the achievement of SDG14 is progressing in the Mediterranean.